New for 2006! Now there are two ways to join the PJB club! Method 1 - Automatic Annual Subscription via PayPal. Simply click on the "subscribe" button to the left to begin the sign up process. Please note that this subscription is completely automatic. You will be billed $50.00 for the first year (includes membership kit) and $20.00 per year thereafter -- automatically. 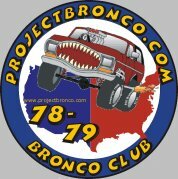 IMPORTANT: Please enter following information during the PayPal signup process: Name, address, phone number, email address, user name from the PJB Forums (if registered), shirt size, and any general information about your Ford truck or Bronco you would like to share. Enclose a check or money order made out to ProjetBronco for the amount of $50.00, along with the amount of any additional merchandise you would like to order at this time. To purchase additional merchandise, please print & fill out the merchandise order form. That's it. That's all there is to it. So print out the order form below and get your payment in the mail to join the fastest growing Bronco Club on the Internet!